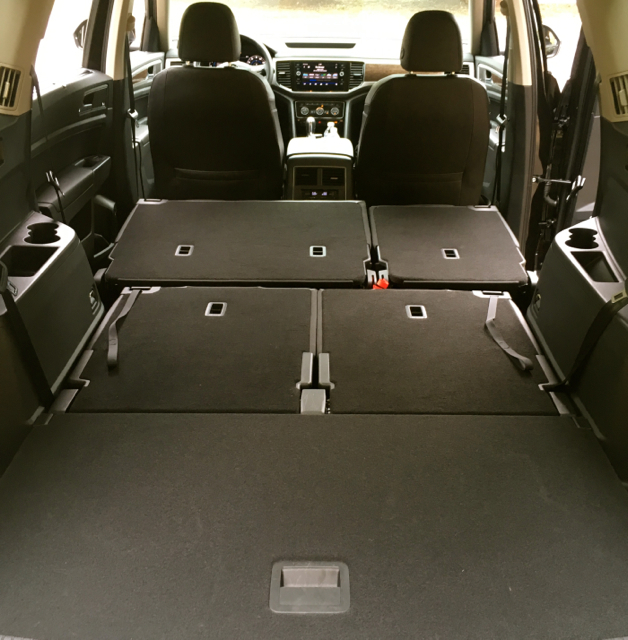 Made-in-Tennessee SUV offers a longer bumper-to-bumper warranty. 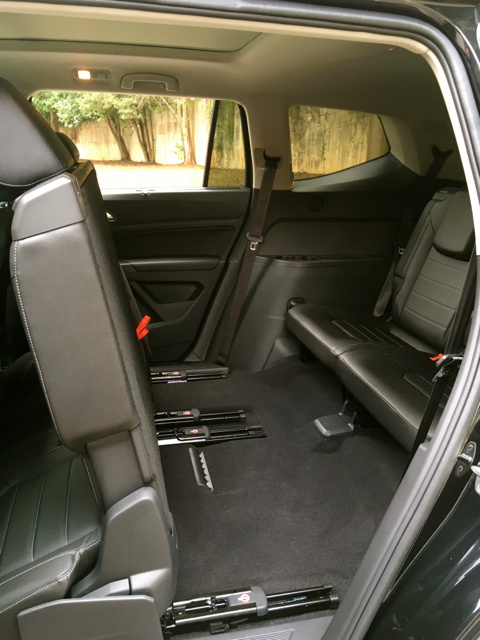 The all-new 2018 VW Atlas three-row midsize SUV. An atlas may describe a collection of maps, but in Greek mythology, he is the titan condemned to hold up the sky for eternity. More commonly, we see statues of Atlas holding up the earth, including the one on display in front of Rockefeller Center in New York. But Volkswagen may have had the Roman poet Virgil’s translation of the word in mind — hard, enduring — to describe its all-new three-row midsize SUV. Or, it may have snatched the name away from Ford as “Atlas” was the term the blue oval used for its concept truck, which later became the current-generation aluminum-bodied Ford F-150. 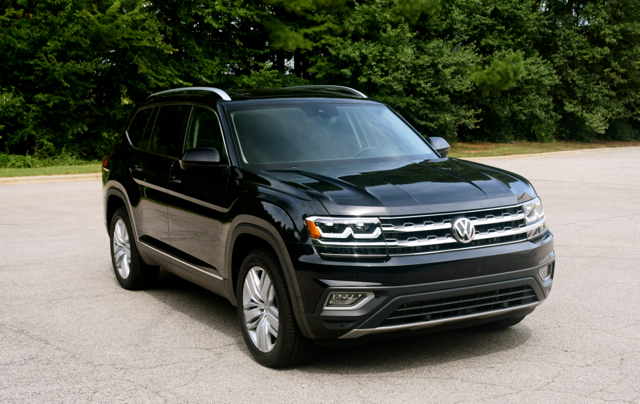 No matter, the 2018 Volkswagen Atlas is a breath of fresh air for this German automaker, the same company who brought us the Beetle, Rabbit/Golf, and Jetta to the US, but not much else of significance. Sure, we had a series of diesels, but VW pulled the last bunch from the market following a widespread emissions violation. In any case we’re not likely to see an oil burner from this automaker again. Instead, Volkswagen has updated its US portfolio to reflect the vehicles customers want most. For 2018, VW delivers a one-two punch as the second-generation compact Tiguan follows the all-new Atlas to the market. Throw in the VW Alltrack and this automaker suddenly is relevant in a previously underserved segment. 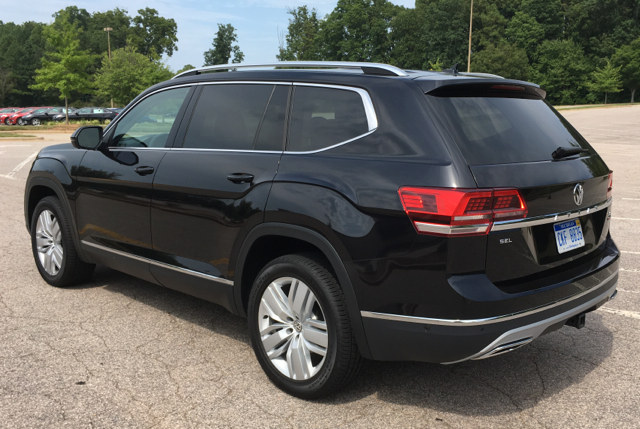 My test model was a top-of-the-line 2018 VW Atlas SEL Premium, an all-wheel drive model loaded to the max and priced accordingly: just shy of $50,000. That’s still $5,000 less than the top-end 2018 Buick Enclave Avenir and in line with loaded models such as the Toyota Highlander, Ford Explorer, and Chevrolet Traverse. 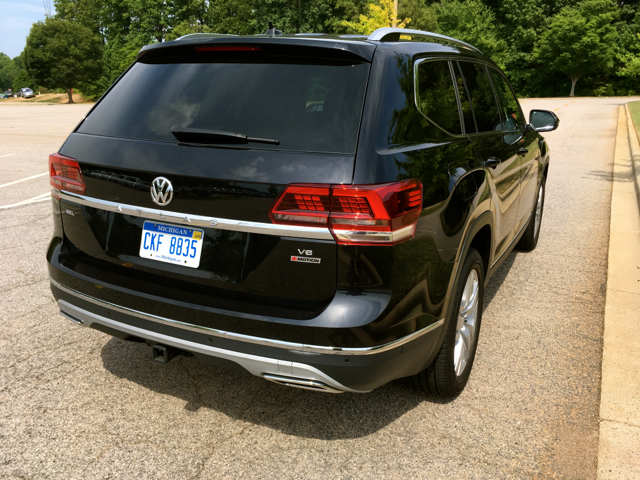 Without the VW badging, you might think this vehicle is something else — more than once I caught people scanning the Atlas as they took in its large size. Indeed, this is the largest Volkswagen model ever sold in the US — you can’t really count the VW Routan, which was a rebadged Chrysler Town & Country. 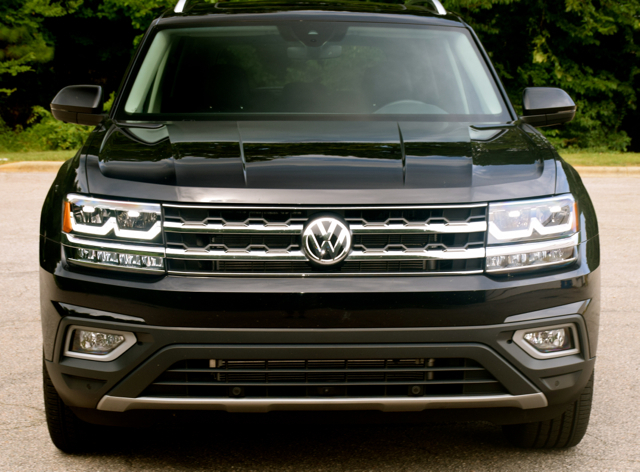 Up front, the Atlas comes marked by VW’s familiar fascia, with custom LED light signatures giving it a polished look. This model projects a strong presence with firm shoulders, a high beltline, sweeping roofline, and the expected large tailgate. One interesting thing of note about the exterior — the character line on both sides sweeps up and down, and even crosses the fuel door — that’s something I haven’t seen before. 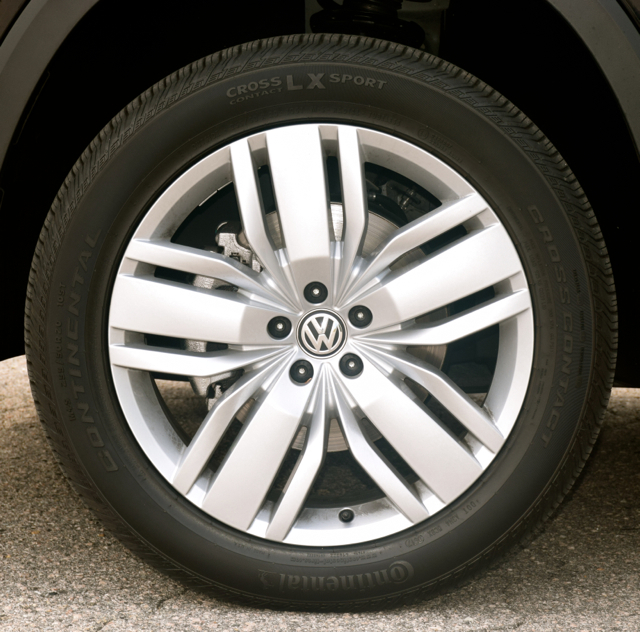 All models come with aluminum-alloy wheels. Except for the SEL Premium outfitted with 20-inch wheels, 18-inch wheels are standard. The SEL Premium also offers black wheel design for a look that is at once sporty as it is elegant. Inside, the cabin features a standard 2+3+2 layout, or you can substitute the middle row bench seat with a pair of captain’s chairs. If you think the captain’s chairs simply make it easier to access the third row, you would be right. 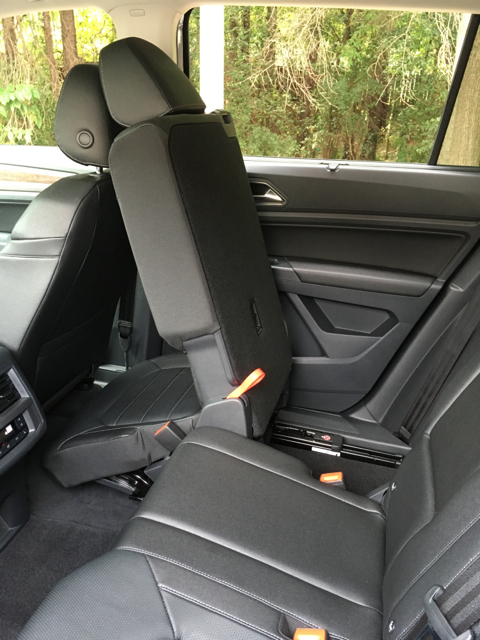 That said, the middle row seats feature a novel design whereby they slide and tilt all the way forward, even with a child seat in place. From there, it is easy to get to the third row or exit that area. And not all three-row crossovers offer a comfortable third row. 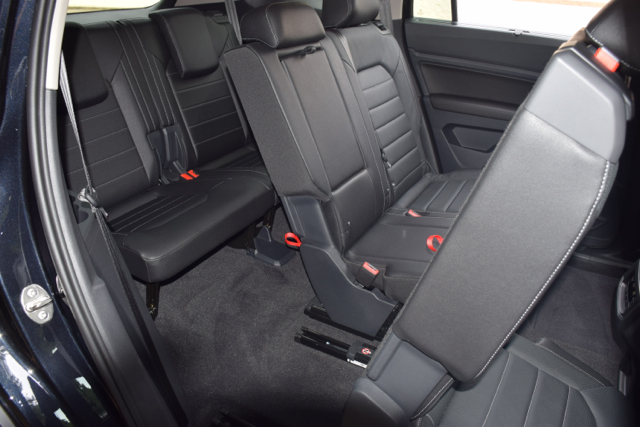 The VW Atlas is the exception as adults can fit back there with ample head, shoulder, hip, and legroom. The seats aren’t as comfortable as the second row, but they’re definitely manageable. 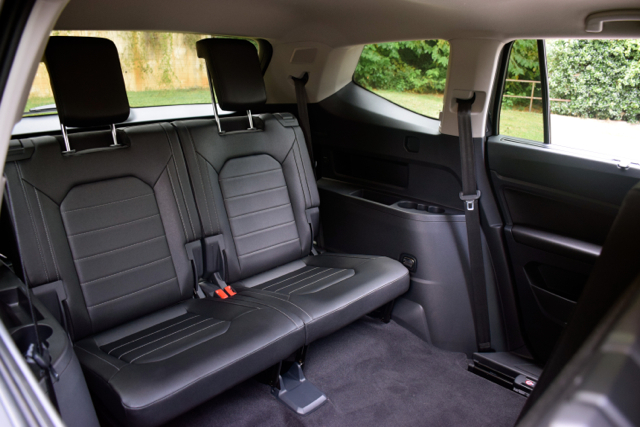 Kudos to Volkswagen for designing and executing a true 7-passenger SUV. Supplying a top-of-the-line model definitely skews the review toward favoring a particular product. 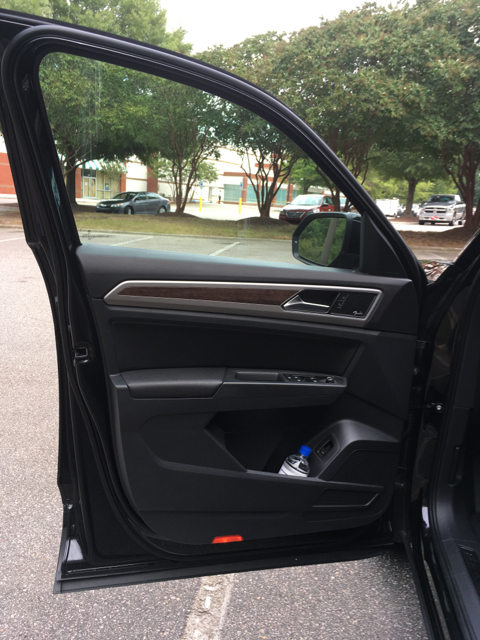 Standard features include black cloth seats, metallic trim, dual-zone climate control with air vents across all three rows, a multifunction steering wheel, cruise control, electric parking brake, a pair of reading lights in each row, and manually operated seats. 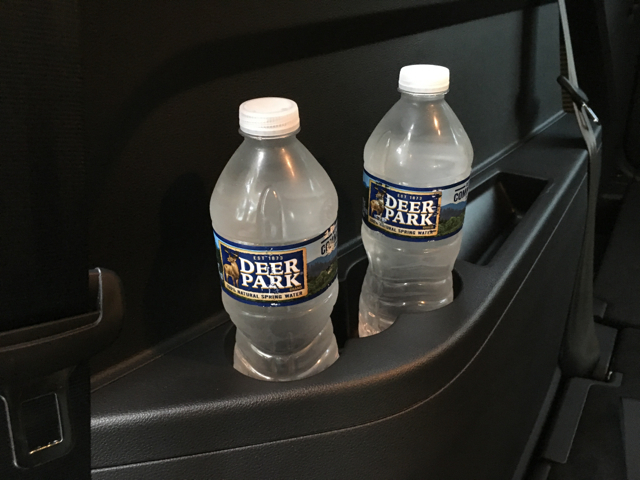 A lockable glove box, four trunk tie down hooks, a cargo area grocery hook, and under floor cargo area storage is also included. The features list expands as you work your way up through the model line. 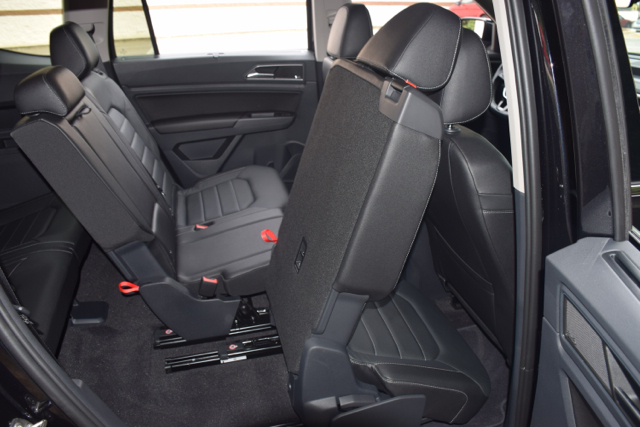 SE models bring in keyless entry, imitation leather seats, and second-row middle armrest integrated cup holders. 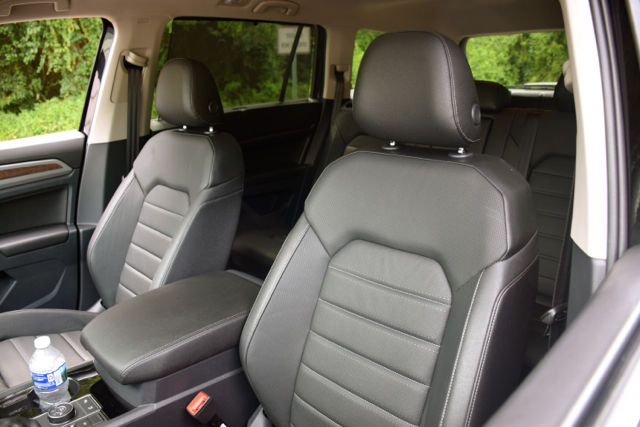 At the SEL grade, you’ll find driver seat memory, 12-way power front seats, and three-zone climate control. The SEL Premium has a digital cockpit, leather seats and heated outboard second-row seats. The National Highway Traffic Safety Administration (NHTSA) has yet to crash test the 2018 Atlas. However, the Insurance Institute for Highway Safety (IIHS) has, awarding this model with a Top Safety Pick rating. The IIHS gave the Atlas top scores in all crash test categories and recognized this SUV’s available adaptive cruise control system with forward collision warning and autonomous emergency braking with pedestrian monitoring system. 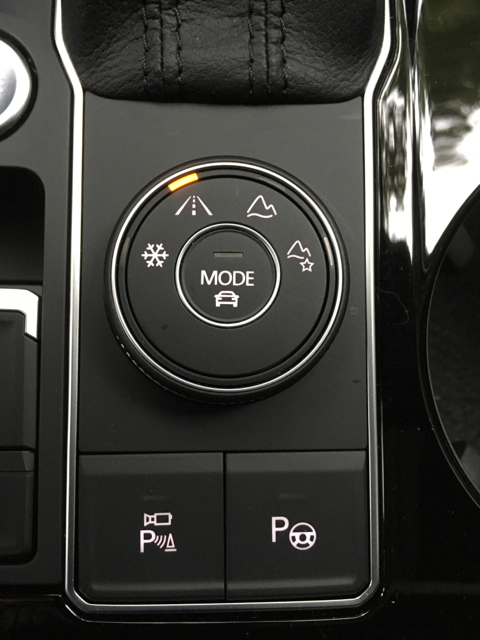 Additional driver assist features include blind spot warning with rear traffic alert, lane departure warning with lane keep assist, front and rear park distance control, parking steering assistant, and high beam control. A rearview camera comes standard; an available overview camera adds surround view. An automatic post-collision braking system comes standard across the Atlas line. 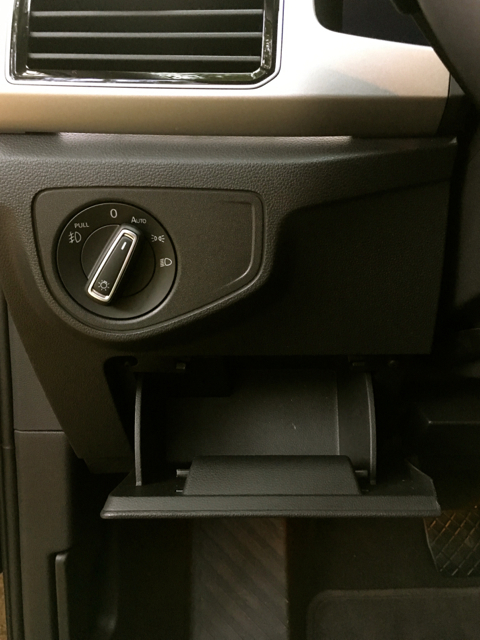 Technology features include cruise control, an electric parking brake, a 6-speaker audio system, 6.5-inch screen, Bluetooth connectivity, USB and an auxiliary input port, Volkswagen Car-Net App-Connect, three 12-volt power outlets, and six reading lights. 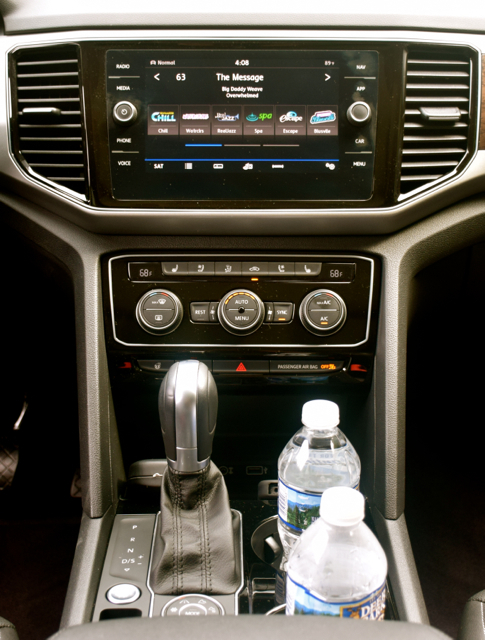 Also available you’ll find keyless entry with push-button start, satellite radio, CD player, and an 8-inch screen. Audio system upgrades include an 8-speaker system on some models. A Fender Premium audio system comes with the top-trim model only, a 480-watt, 12-speaker arrangement. With the 2018 Atlas, Volkswagen offers a pair of engine choices. My test model came with the 3.6-liter V6 generating 276 horsepower and 266 pound-feet of torque. The other choice is a 2.0-liter turbocharged four-cylinder engine making 235 horsepower and 258 pound-feet of torque (with premium unleaded gasoline). Both engines come with an 8-speed automatic transmission. However, the turbo is available only with front-wheel drive. You’ll need the V6 elsewhere. By the way, the V6 matches what most other models in this segment offer in terms of towing capacity: 5,000 pounds. The VW Atlas offers a commanding view of the road. The V6 supplies ample off-the-road acceleration, steadily and smoothly picking up speeds with the transmission shifting confidently. The power numbers are slightly below such models as the Chevrolet Traverse (305 hp; 260 torque), but greater than the Nissan Pathfinder (260 hp; 240 torque). Steering, handling, and braking is what you’d expect in most any midsize SUV — capable, even inspiring with 4Motion all-wheel drive, and able to get the job done. Spend time behind the wheel of this VW and you’ll likely concur. Well, Volkswagen has finally done it — the German automaker now offers a full line of SUVs, matching what most competitors offer, and with better warranties (see the chart below). Yes, I’m including the VW AllTrack in the mix, a model best compared to the smallest SUVs out there. Along with the all-new Tiguan, the VW trio meets the needs of most customers. What you should also know is that the previously available Touareg is gone. It was an odd fit for Volkswagen anyway, offering Audi-like amenities and a price tag to go with it. Auto Trends believes that a new model will eventually slot between the Tiguan and Atlas, perhaps a five-passenger midsize SUV with the Ford Edge one of its competitors. All in all, the VW Atlas is an able competitor to the more established players. Prices can quickly build up, but if you’re looking for a well-equipped SUV with technology features, then the SE with Tech. and all-wheel drive can be had for just under $40,000. That’s a price point common to this segment and an ideal place to start your search.